On December 12, 2017 President Trump signed the National Defense Authorization Act. In part, the Act requires registration of all drones weighing more than .55 and up to 55 pounds, if you plan on flying them outside. Drone owners may find these requirements familiar. 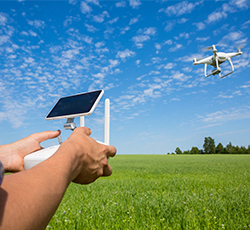 In late 2015, the Federal Aviation Administration (FAA) introduced rules requiring owners of drones to register with the FAA before their drone’s first outdoor flight. In May of 2017, a D.C. court of appeals overruled that requirement and the FAA was in the process of returning the registration fees. Now it seems the rule is back in place. The FAA will now require all drone users to put a valid registration number on the drone when it is in use and to keep the registration certificate nearby while operating. The cost of registering your drone is $5 and can be completed online here. The civil penalty for failing to register can be as costly as $27,500 and the criminal penalty can be as large as $250,000 or three years in jail. The registration requirement goes into effect immediately and we recommend that drone users, along with the people that have received them as gifts, that are affected by this requirement register as soon as possible. Please contact a Foster Swift Business & Corporate attorney if you have any questions regarding drone registration.